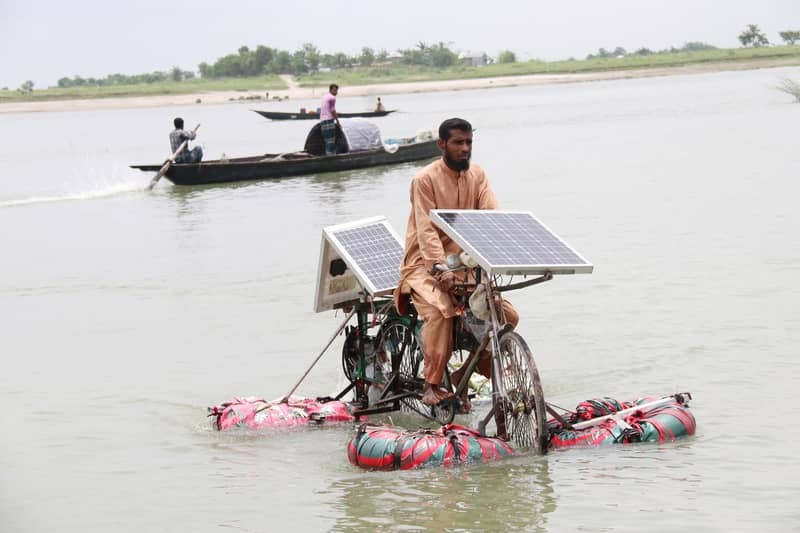 The lifelong dream of a young man, Saiful Islam, comes true as he has recently completed building a bicycle after one year of dedication that can run on water, too. With its handle and carriers enhanced by solar panels, four small tubes are attached to each of its wheel, which ensures that the cycle stays afloat in water. The tubes can be shifted upwards for paddling the cycle on the road as well. Coming from a humble family at Paikpara village in Madhukhali upazila, Saiful, a 32-year-old man, could not complete his institutional education, yet his zeal for innovation was not confined within the walls of Biswa Zaker Manzil Madrasah, from where he completed his Kamil studies and joined Shakti Solar Light as a manager. Soon he left the job, and unemployment drove him to innovate. It was then that the idea of experimenting with a vehicle that could tread both road and water came to his mind. It took him Tk 20,000 to initially purchase two solar panels, four air chambers, a motor, battery, a gear box and others to build such a bicycle. After he finished building his first prototype, he test-drove the cycle at Shahartali’s Dhalar More picnic spot, where he rode it on water and crossed a 200m canal. Talking to Saiful Islam, he said it was always his dream to experiment with machines and objects ever since he was young. When he was five, he had once used paper, glass and junkets to make a two feet-long bus, which had attracted public attention. He also said it took him six months to make the bicycle. But, he cited the lack of funds to improve on his prototype, which he further intends to make lighter in weight and also levitate in the air. In order to materialise his dream, he needs the support of private patrons. Prof Abul Kashem of Bangla Department of Alfadanga Adarsha Degree College here said Saiful’s invention has drawn the attention of many people from various parts of the country, but lack of finance has hindered its progress. Hasibul Hasan, a local engineer, said to make Saiful’s bicycle dream a success, it needs to be more lighter and cheaper to construct, which will greatly benefit the people of the char areas. In the future, Saiful also intends to build solar-powered rice cutter machines and auto rickshaws, as well as a water and land-accessible solar-powered speedboat.